I am happy to have found an online community of mothers that I get to talk to, relate with and share stories with. Between all of the social media outlets I can put out a sentence or two about the kind of day I am having, or a specific child phenomena and often get feedback and support within minutes. But Friday night I was reminded of the good old-fashioned way of doing that! It was mom’s night in with several of my favorite ladies in real life. We ate and we drank (some maybe had more “adult” beverages than others, who that may or may not have been will remain confidential). The evening stretched on in time, but felt very short indeed. It was wonderful to talk about whatever crossed our minds. Questions about our children, our husbands, our jobs or lack there of. We laughed-full on hold your stomach, cheeks hurting from smiling so much. At moments some of us got teary-eyed. Our hostess for the evening, my friend Marcy, had her sons at home for the evening. Mostly they spent time upstairs or in their family office watching Clone Wars. When they discussed the evening this morning they were quoted as saying two of my favorite things ever. One will never let his wife have her friends over because women are too loud. The other stated he didn’t know how we could even understand each other with everyone talking at once! All so true, but that’s what makes it so very special. 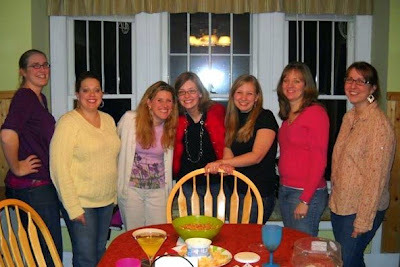 We had had our first mom’s night in in November, and had skipped December because of the holidays. Yesterday was wonderful, and I am left with the acute desire to make sure that we continue to get together every month. I truly believe that is essential for us to make sure we are a community of mothers supporting and caring for each other. And everyone needs hearty, turn your face red belly laughs from time to time to make life fun! Sounds like you had a great time! We do need time to have good laughs with other moms! A friend of mine and I are starting a mom's group in our neighborhood community next month in hopes to have evenings like yours! Thanks for stopping by my blog!!! It's such a nice change of pace getting together with the girls. Good for you for scheduling it in!